We present the Missionary work around the prilgrimages made in non-remote lands for preach the Gospel of true, Me, Dimitri J. S. Kusari; I am witness that the non-remote lands aren't with order in their churches because they hadn't ecclesiastical forces and some tensions of Diplomacy and customs about the countries made the war around Asia and the Islandic Lands. In the "Bibliotëke dhe Shtypje i Kusari" we offer courses, information and Dictionaries in all languages, since Spanish until the new discovered Chinesse and Japanesse, counting with the Indian and Mongolian Alphabeth that historically is wrote in ancestral letters but now is written in Cyrillic. Mesuës Dimitri Jamil Skënder Kusari - Tarkan I.
Dear Prefect the missionary works are the following cases, the Asian world are sub-divited in one and anothers, wars and another terms in separatism among them, Ottomans said me a good idea that is: Make the International market for low the wars and the bad things, Ottoman Empire has overproduction and they cannot sell into another kingdoms, I am traveling Bulgaria for make commercial & religious Alliances. 1. - Ottoman Empire (Osmanlı Imparatorlugu - بعثة العثمانية) - : This is one of the missionary preachings are active, the moment of talk with them, they're enchanted by the gospel and the missionary action, besides; in these zone we can activate the Turkish Market, that it already has interesting and exotical Things, by another hand; making alliances we can low wars and we make the end of the pirates. 3. - Serbian and Czech Kingdoms - : In this zone also we can preach, as Ottoman, the ecclesiastical force is null, in Czech Kingdom, they have another thinking but we can help them, making the Aristotle's Word, and Serbia has a unique religion (The Serbian Autocephalus Church), it's question of talk. 4. 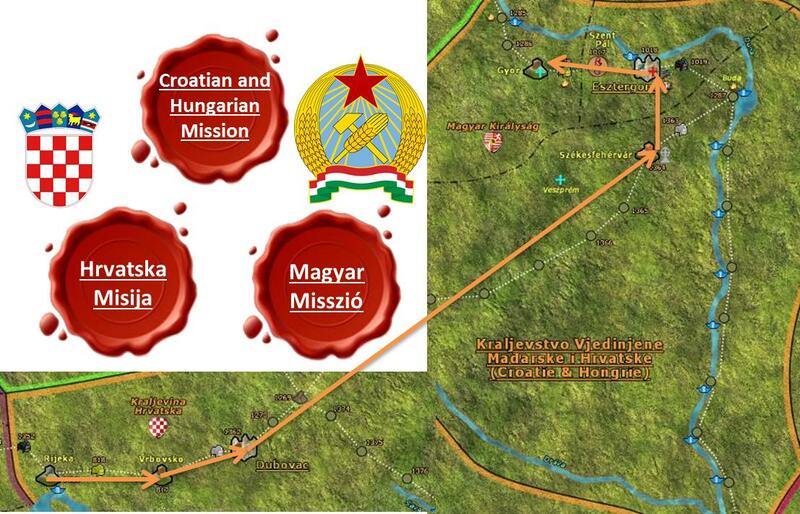 - Croatian and Hungarian Kingdoms - :Croatian and Hungarian Kingdoms are divided but the asleep ecclessiastical movement aren't easy of preach, the movement must enter in an iniciative, preach inside the Aristotelism making part of another religion. 5. 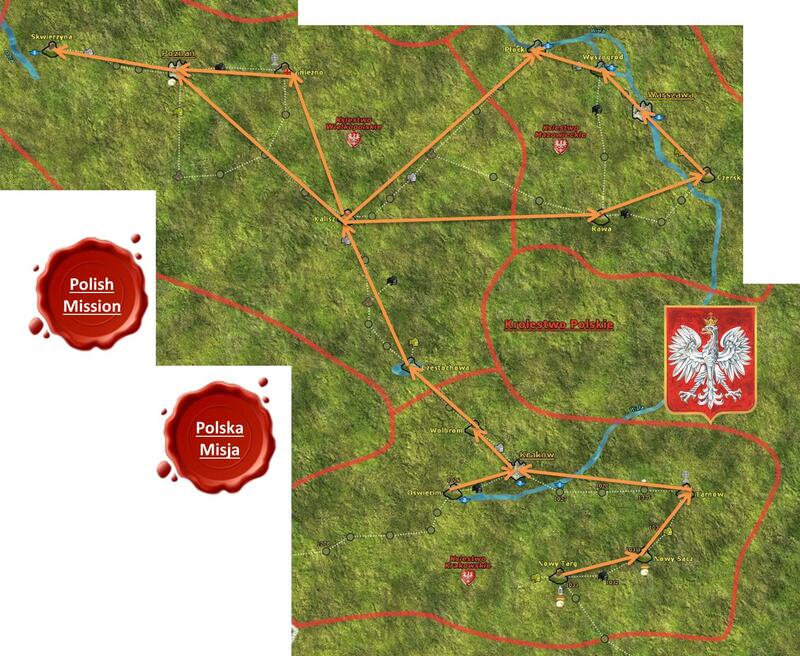 - Polish Kingdom - : No informations for now. 6. - Danish, Finnish & Russian Kingdoms - :No informations for now. 7. 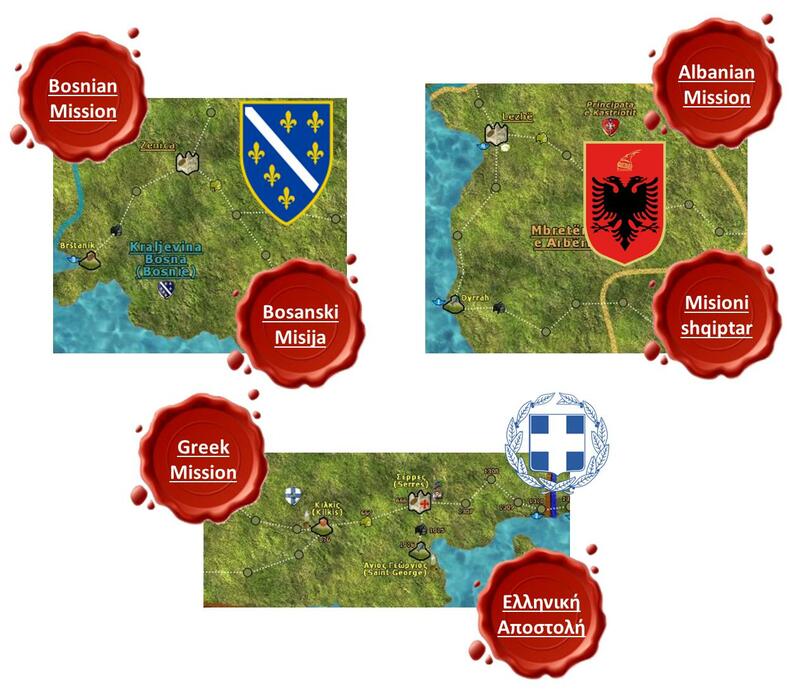 - Bosnian, Albanian & Greek Kingdoms - : In these three kingdoms the religion are splited, in Bosnia exists a pacific religion, without aristotelism, but we can preach because the ecclessiastical forces aren't good formalized, in Albania is an aristotelic and organizated religion but only hasn't a force for now, counting that ecclessiastical documents and books aren't translated in their language. In Greek church we stimate an involuntary schism with a different Aristotelism, but we can contact with their leader for make preachings. 8. 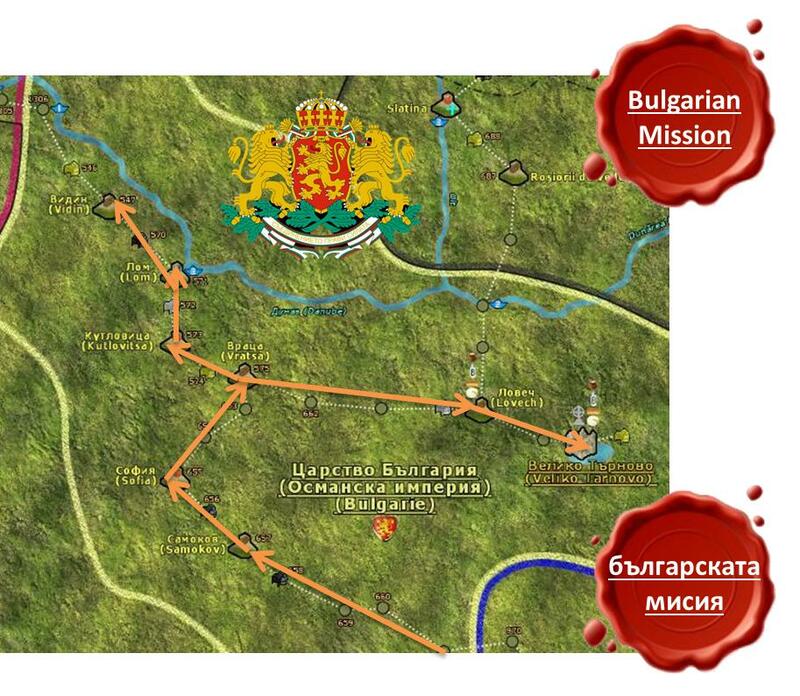 - Rumanian Kingdom - : No informations for now. Inside our will of preaching, we are joining monetary founds for build a Ship for navigations. Therefore, in this moment the plans of travel are reserved by the Missionary Campaign, the missionary force is volontary children that want meet the world and the God's will. I like the project. And I support Napoleon's words, we need more information, the exact route, its reasons (is there any holy relic? something else about turkish saints?, etc?). When you have it ready, feel free to add it! I support cardinal Nicolino's words too . For me the project is also very interesting. I would like to add yet another question. Think you that will participate a large number of people to the presented routes? Who would be the religious istitution - or military defence and leader who would lead the faithful in to the routes? Beginning for another subjects, for restore peace I had the idea for make the inter-kingdom commercial campaign for increase the ottoman commercial activity for restore peace and delete wars and bad reputation.. I don't know, maybe we can delete the Balcan's conflicts. Your project seems very interesting and articulate. I thought about what to do. in this office will put the projects and with which you will update us on activities. Prior approval would be desirable peroration of a cardinal. -Dear brother, I am seeing the opportunity with the project well, I want say ye somethings also, I was ordering the Ottman church (or Mosque), in this case; I seek more information about another lands in mission if you have, thus; the Ottoman clerics has been ordenated and the church is codified yet, and I want ask you about the cardinal? We have one of them. Instead, I was one priest InGratebus for one city bit for codifing I was out now, it's weird, for another case, I am exploring another lands also for make more missions, and about Serbia and Bosnia, they have another religion and they could not change it, Serbia has not relationship with Rome, and Greece is the 50% that they can accept aristotelism, but as that I had received the Ottoman nationality they did not talk with me... I am trying umtil the responses becomes well... In Ottoman was "Getsumi" one of greeks that translated the Aristotle's will.. I had made some questions about that and these answers some interesting. dear. we must make it clear that the Aristotelian church only approves Aristotelian missions and for the glory of Christos and Aristotle prophets. Other churches or mosques affect us if not for the fact that there are antagonistic. Even if you're on a mission, you can get in touch with the cardinal that you know and you plead in our prefecture. doing this will give you a Office. Ottoman preaches the Aristotelism, they know that Aristotelism is the unique religion in the Earth and we can say also that they have own ResParendu's similarities.... Nobody is antagonistic one of another. Well then brother. Antagonist does not mean absolute enemy ... but the One True Faith is the Aristotelian and then the other faiths are wrong in according to our beliefs. There can be a little tolerance and dialogue, but the underlying principle remains the same .... it is also important to keep this in mind during missions. I am pleased for the faithful Aristotelian Ottomans. 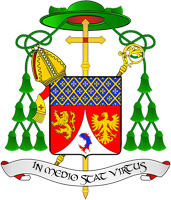 I need at this point a copy of your previous appointment as priest Aristotelian and advocacy of your cardinal. I am sure that your work, if you firmly to the Holy Church of Rome, through our prefecture, will be a real treasure for the whole Universal Church until to the ends of the world. I wait for you. We are waiting Until you will have the time to be able to respond at the demands for The approval of your very laudable project for the Universal Church. there are any news abot this?